Your Source For Ski Resort Deals. Ski vacation packages to New Hampshire. Take advantage of our deals, discounts, the best planning advice, or create your own ski / snowboard package. 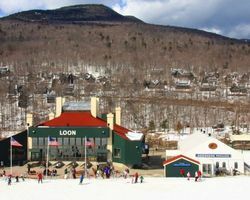 Loon Mountain offers year around activities for the entire family. Nestled in the White Mountains National Forest it boasts 61 trails totaling 27 miles serviced by ten lifts including one gondola. Loon Mountain's base elevation is 950 feet, summit elevation is 3,050 feet and the vertical drop is 2,100 feet.